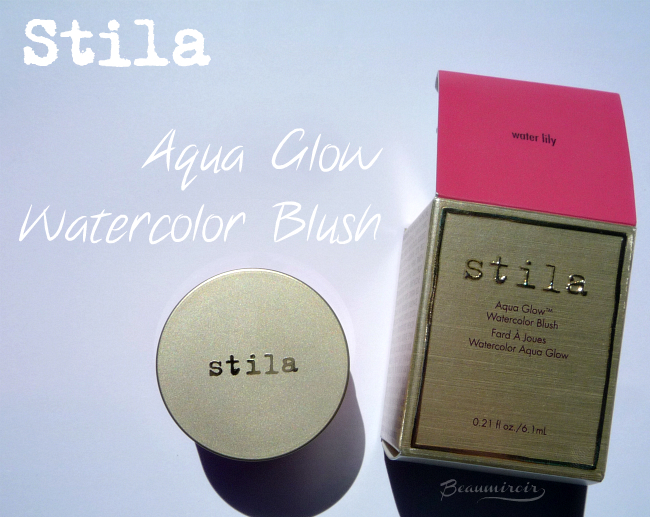 Stila Aqua Glow Watercolor Blush in Water Lily: a new summer liquid blush! When pictures of Stila's summer 2015 makeup collection started showing up a few months ago, I knew I had to try one of the new Aqua Glow Watercolor Blushes. 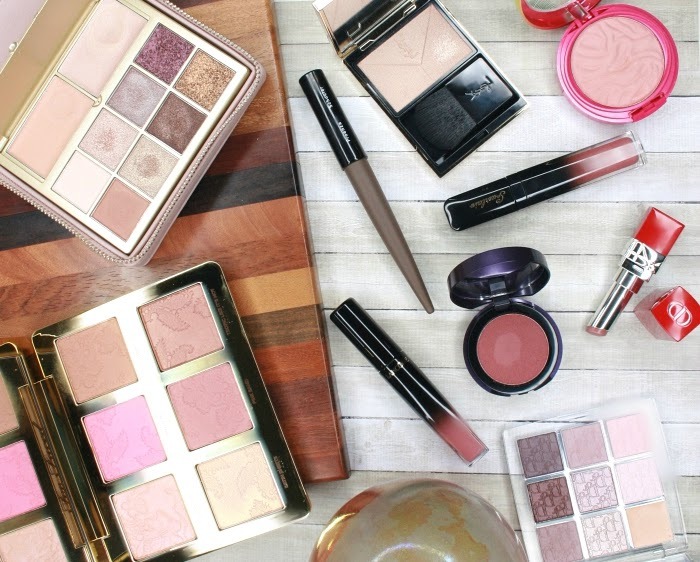 I'm a fan of liquid everything, along with my cream everything addiction, and the cute packaging and bright summery shades looked irresistible. My intuition that this new blush formula would be the one of the best new product launches of the season was confirmed by a feverish session of in-store swatching, and after much internal debate, I settled for the shade called Water Lily. According to Stila the new Aqua Glow Watercolor Blushes are a weightless, water-based formula that's supposed to provide a "sheer splash of color" with a cooling and hydrating sensation and a luminous, glowy finish. The brand describes the packaging as a "mesh-touch color dispenser [that] delivers a single splash of color per application", and the product as buildable, long-wear, non-transfer and waterproof. 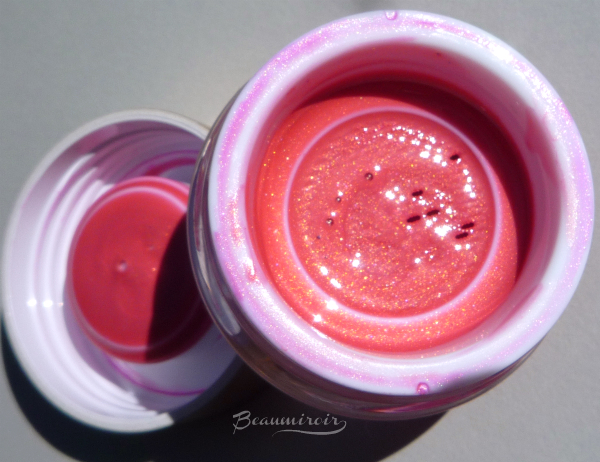 Unlike other liquid blushes I've tried, this Watercolor Blush comes in a small clear plastic jar, with a frosted pale gold lid. The packaging is very pretty, and very unusual for this type of product. A sticker warns that you must shake it before use (the sticker left glue residue that I wasn't able to remove. I know, small detail, but it's too bad the cute pot is "scarred"). Inside the jar is a kind of mesh net, similar to what you find in loose powder jars. I get it for loose powders: it keeps your brush from getting all the way inside and picking up too much product. I don't really get it here: the use of that net remains a mystery to me. When the jar is new and full, this net is mostly submerged. I've never even touched it. Since you have to shake the pot before opening, a good amount of product is left on the inside of the lid, which is were I pick it up with my fingers. So the "dispenser" that delivers " a single splash" claim leaves me puzzled... what the hell are they talking about? How does this net deliver anything? Was this included just to give this product the appearance of a "cushion" the new makeup packaging rage coming from Asia? I couldn't say. One more word about the jar: you better close the lid really tightly, otherwise you could experience leakage to the sides like I did. 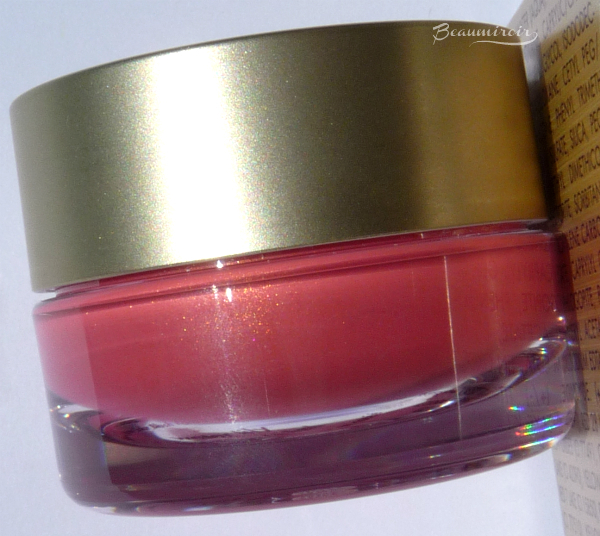 The formula appears unscented, it has a faint chemical smell that I can only detect when I stick my nose in the jar! The new Watercolor Blush has a light, fluid gel-like texture that feels creamy to the touch. It's very easy to blend with fingertips, as it glides across the skin without effort and takes a couple minutes to set and dry. A brush would probably work too, but with a liquid formula like this, you'd be wasting a lot of product that would just be absorbed in your brush hair. Contrary to Stila's claims, I don't feel any cooling effect at all, nor do I feel like this is particularly hydrating. It does feel very lightweight and leaves no sticky or greasy sensation once dry. One of the problems that may arise during application is that if you apply it over foundation, it will melt it. I've experienced this with every liquid/cream foundation I tried to use it with. 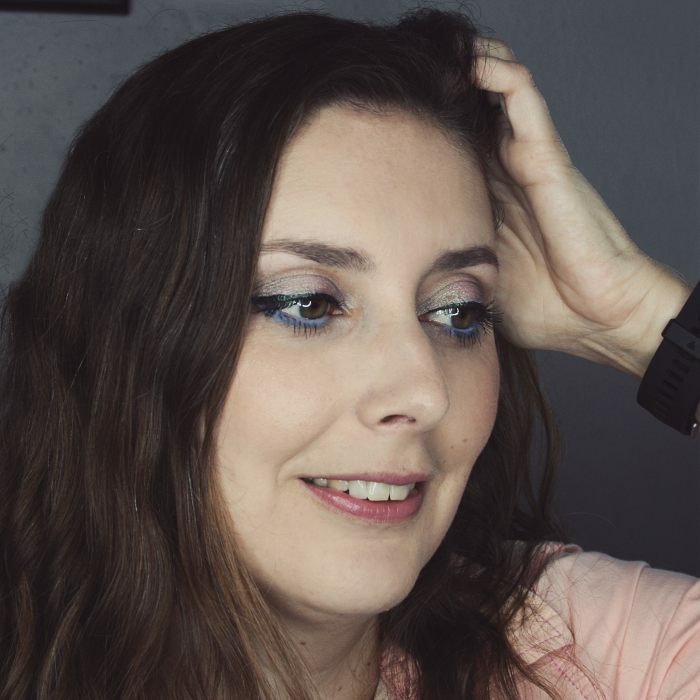 It wasn't a major issue for me though because the foundation dries back down with the blush, creating a super natural, seamless finish since both products "fused" together. But if having perfect, flawless foundation is important for you, you might find it disturbing. I didn't have any problems wearing it on top of powder foundation or on bare skin. Let's talk about the pigmentation here for a minute. 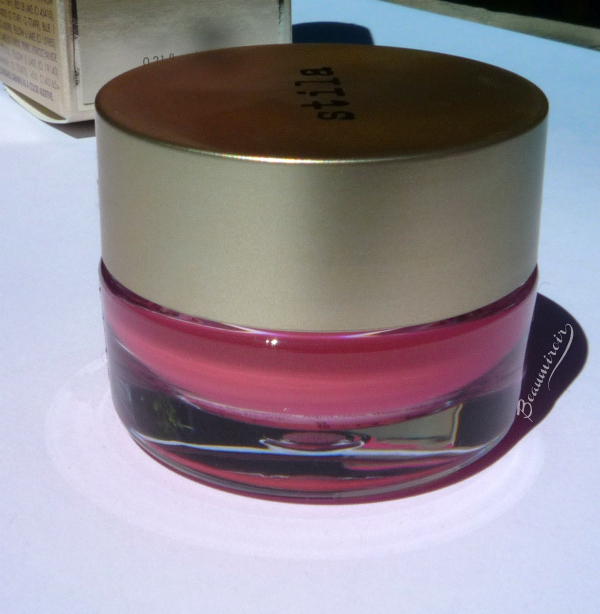 So this product is sheer alright, meaning that it is translucent rather than opaque, as in, you can see your skin through. I was amazed, however, by its intense pigmentation. It might be specific to this particular shade, Water Lily, as others appeared a bit less pigmented. I would hardly call this a watercolor, and if you think this is similar to Benefit's famous Benetint, you're in for a surprise. Being someone who likes my cheeks very natural, I need to use the tiniest amount and blend well to get the result I want. It's very easy to overdo on light skintone like mine: the first time I tried it, being unaware of the pigmentation level, I ended up looking like a Russian porcelain doll with bright coral cheeks! 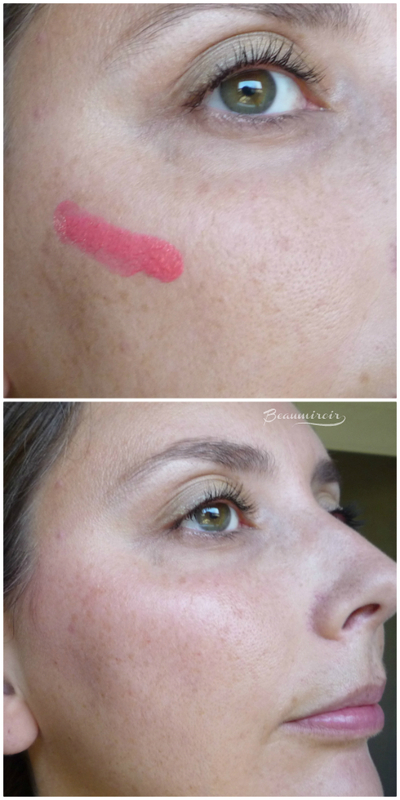 Applied very lightly, it does give me a natural, pretty flushed cheek. 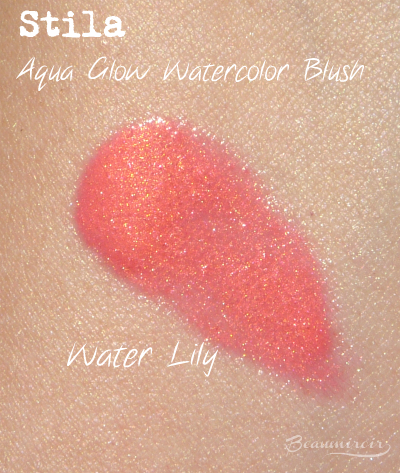 Water Lily, the shade I picked, is a bright coral bordering neon territory with very fine golden shimmer. It was hard to photograph, as all neons are, so you should try to see it in person if you're not too sure about the color. 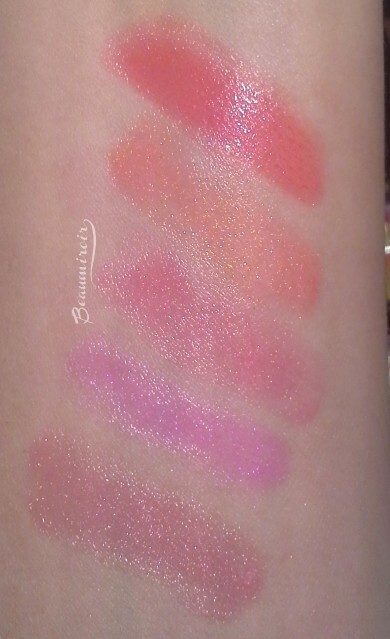 Somehow, although it looks packed with shimmer when I swatch it, I can't find any reflective particles on my cheeks. I don't know where they're going, but they disappear to leave a luminous finish behind. I wouldn't call it glowy, it's more of a natural finish with extra luminosity. It doesn't look greasy on me, even on those steamy hot days when the center of my face turns into a fried chicken-like oily mess. I really like how Water Lily looks on me. It's a beautiful coral pink (not too neon once blended) that illuminates my face and makes me look healthy and happy. On me, it wears pretty much all day, and although I haven't tried to immerse my face in water to test it, the waterproof claim seems to be true, as it resists sweat and splashes of mineral water throughout the day (I'm a fan of water sprays during the summer). 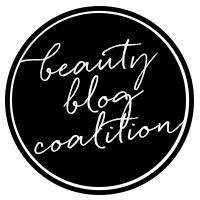 Overall: a great new liquid blush formula! Although I don't get how the packaging is supposed to be helpful, I find it very cute. 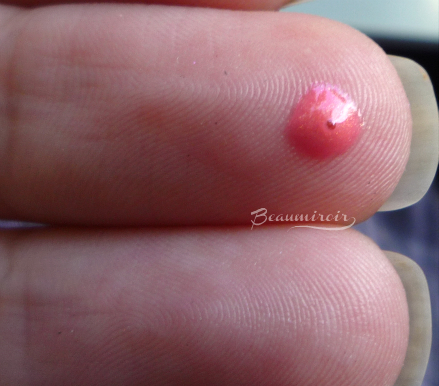 What makes this Watercolor Blush a winner in my book is the ease of application (fingertip power! ), the beautiful, luminous summery color and the all-day wear. Where to buy? Currently on sale for $8 a piece on Stila's website! !